There has been plenty in the news recently about Microchipping dogs and the legalities that surround it. Whilst it is still not a legal requirement for cats to be Microchipped, it may be a great idea for owners to understand just why Microchipping your cat is important. Microchipping is a method of identifying a pet simply by scanning a small device under the skin. After the Microchip is inserted it will remain there for the lifetime of your cat, and at any point if your cat is found and taken to a vet they can be scanned and compared with a database whereby they can find and contact you. Microchipping is a simple procedure that will only cost around £20-£30 to carry out. It is no more painful for your cat than getting an injection and is carried out using a specialist device that is known as an implanter. The tiny chip is smaller than a grain of rice so your cat won’t even notice it. Vets suggest that cats are Microchipped as early as the time of their first or second set of vaccinations; they will also tell you that it is never too late to get your grumpy old tom cat a microchip! Once your cat has been fitted with the chip they will be placed on a database with your contact details listed against them. It is your responsibility to advise the company that maintains the database of any changes that will affect the information they hold. This can include a change of address and telephone number as well as if your cat changes owner. Compared to the use of collars; Microchips are not only more reliable as a method (due to them not being able to be removed) but are also safer for your cat too. The most important reason to Microchip your cat is so that you can be notified if they are taken into a vets. This may be due to them going missing or perhaps if they are injured whilst out roaming and need to be treated as an emergency. Microchipping offers real peace of mind for cat owners and is particularly recommended if your cat is prone to wandering. With a simple scan, using a hand held device that all vets have in their clinics, you can be reunited with your kitty should they go missing or get hurt whilst out and about! A vital helping hand for any owner! 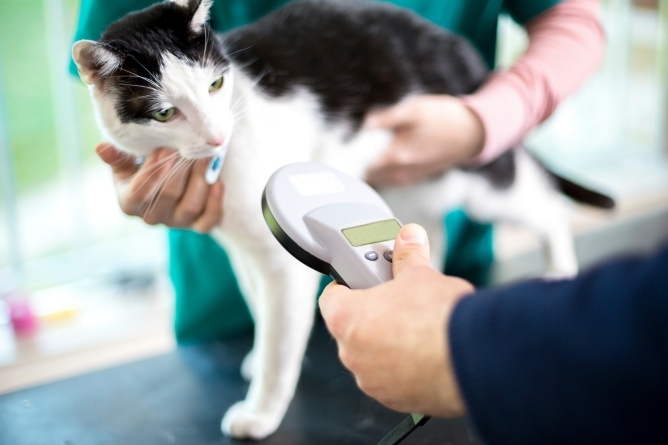 Want to know more about microchipping your cat? We have some sensible advice about how to get your cat microchipped and what to expect. This entry was posted in Cats, Health and tagged microchip, Mircochipping.